Helicopter taking off from Kapitan Khlebnikov for penguin rookery visit. Chinstrap penguin, South Thule, South Sandwich Islands, Antarctica. 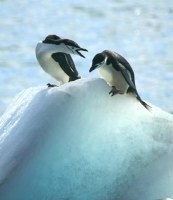 Adelie penguins on iceberg, Deception Island, Antarctica. Emperor penguin chick in close-up, Atka Bay rookery, Weddell Sea, Antarctica. Emperor penguin chick being fed, Atka Bay rookery, Weddell Sea, Antarctica. Adult emperor penguin and chick, Atka Bay, Weddell Sea, Antarctica. Emperor penguin colony in shelter of Riiser-Larsen ice shelf, Drescher Inlet, Weddell Sea, Antarctica. Emperor penguin returning from sea, Drescher Inlet, Antarctica. Emperor penguin chicks, Halley Bay, Weddell Sea, Antarctica. Emperor penguins entering water, Atka Bay, Weddell Sea, Antarctica. Emperor penguin chick asking to be fed, Halley Bay, Weddell Sea, Antarctica. King penguins, Gold Harbour, South Georgia. Cracks in ice as Kapitan Khlebnikov cuts through ice, Weddell Sea, Antarctica. Drescher Inlet, Weddell Sea, Antarctica. Turquoise iceberg in evening light, Weddell Sea, Antarctica. Sunset reflected on ice, Weddell Sea, Antarctica.